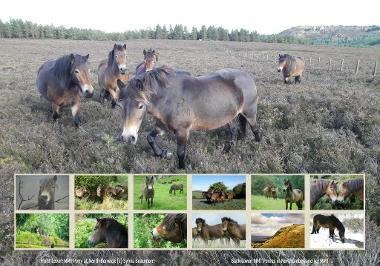 The MMT 13 Ponies of Traprain website! THOMAS BOWER OF DUNBAR, EAST LOTHIAN! Congratulations to Thomas from all the wonderful 13 Pony Kings of Traprain and staff of The Exmoor Pony Centre - home of The Moorland Mousie Trust. You have won £50 worth of MMT merchandise! Who was the winning MMT Traprain Pony? 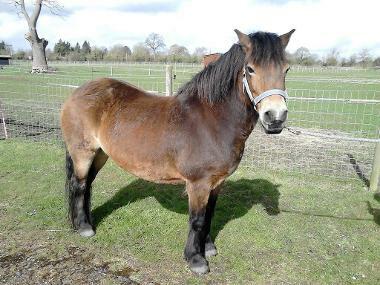 The very gentle and handsome PONY DANDELION! You can see Dandelion in the photo below wearing a gorse brooch.... he's particularly "fashion-conscious" and out of all the Traprain ponies is the most likely to be wearing a favoured gorse brooch....! Dandelion says: Congratulations Thomas! Here's a little of my background I thought you would like to read about. In the Summer of 2011 I was introduced to a beautiful mare called Waltersgay Honey Buzzard and we had a 3.5 month holiday together. In the following May our son Wessaxon Manuka was born! I am so proud of him! Manuka was almost lost as Honey's teats did not drop and so for the first 48 hours she had to be manually and lovingly milked by her owners. 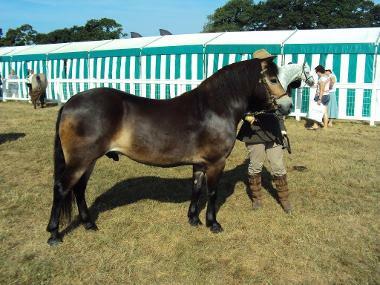 My son Manuka thrived though and has had a lot of success in the Show Ring as a youngster including as a 2 year old Champion gelding at the Exmoor Pony Society Show and Exmoor Foal Show. Wessaxon Manuka lives an exciting life as a hacking pony and looks just like me, Dandelion doesn't he! Waltersgay Honey Buzzard lives an exciting life too as a hacking pony and likes to style herself as a beautiful "field ornament" - but is prepared to be a hacking pony as long as she can snack her way around....! Wessaxon Manuka and Waltersgay Honey Buzzard have a close relationship together while I'm now one of the wonderful 13 Pony Kings of Traprain, leading a very important life helping the World of Conservation while at the same time giving many people great joy of seeing me and my herd. We all send you congratulations Thomas! If you click on the link below it takes you to the EPC/MMT online shop where you can start selecting merchandise you would like. Have fun! Dandelion, Waltersgay Honey Buzzard, Wessaxon Manuka and all at EPC/MMT give special thanks to CAROL STREET, owner of Honey & Manuka - for providing photos and information - which made our Competition possible - THANK YOU! MMT Traprain Pony of 2019! 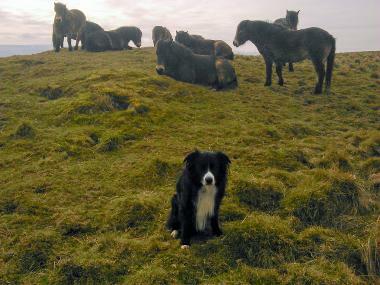 The 13 Pony Kings of Traprain and Pony Dog Skye would like to thank the local community who regularly visit Traprain and show the wonderful ponies great consideration in many ways. Pony Dog Skye has a special message for all his doggie pals : "I love to see my doggie pals but please always respect my pony buddies by not running around them. A nice quiet walk to the summit to see them is the Perfect Doggie Way! Pony-Dog Skye is proud to have come from The Edinburgh Dog & Cat Home and you can find out more about them by going to www.edch.org.uk or telephone 0131 669 5331. The beautiful new EPC/ MMT 2019 Calendar is now available! 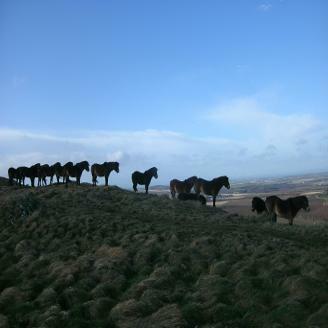 The 2019 Calendar features the MMT conservation ponies - including Traprain! (a limited number of copies will also be available from the Traprain stall - see below on this page). THE EPC / MMT KNITTING & CROCHET CLUB! 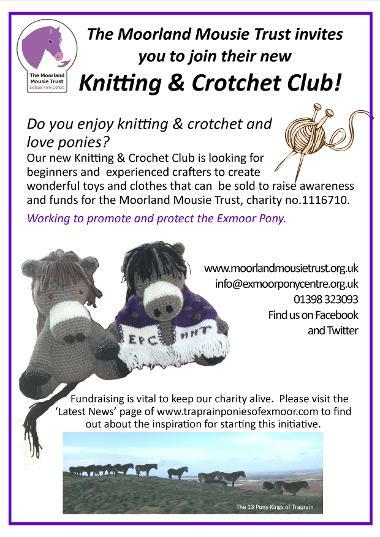 If you love ponies and love knitting and/or crotchet and would like to be part of our new Knitting & Crotchet Club these 2 little friends opposite are keen to hear from you! For full details just click here to go to our "Latest News" page on this website! 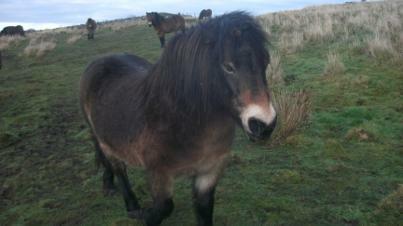 (amigurumi design opposite by "little muggles" with muzzle adapted design to suit the Exmoor Pony!). 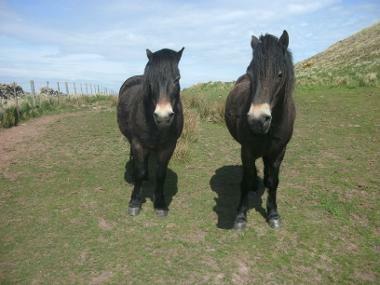 MMT Traprain ponies Tunny (left) and Juglans (right) hope you enjoy their herd's wintery photos below. 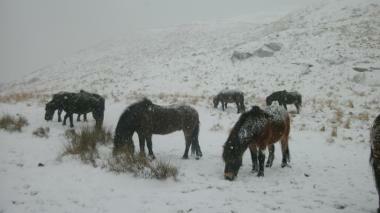 Here they are in Summer 2017 in the same area as the photo below of Pegasus-Whistler with his herd in the snow. Here's some photos of the ponies in the snow of March 2018. 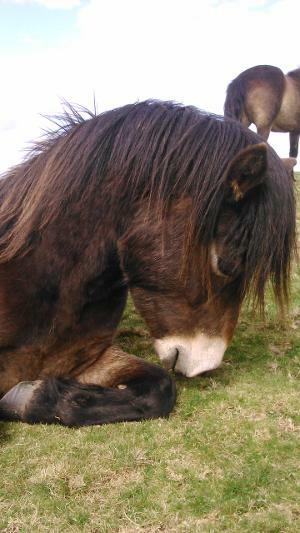 The way they handle this kind of weather shows just how "hardy" the Exmoor pony is. They grow their own winter coats and are totally self-sufficient throughout the hardiest of winters having fun rolling in the snow and favouring many chilly days on the summit rather than at ground level. (They tell me they enjoy the summit views....!). 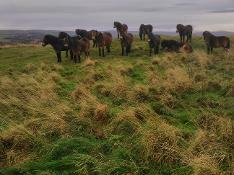 The only type of weather the 13 Pony Kings of Traprain are not keen on is very strong winds and further down this page you can see them sheltering in a beautiful gorse-dressed area which gives excellent protection from strong winds. 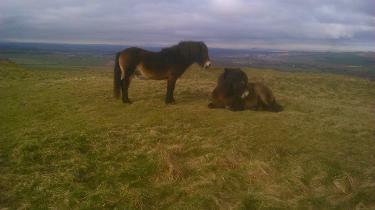 Above left: the ponies enjoying the south summit views. Above right: Pony Bob on the south summit. Pegasus-Whistler and his herd enjoying the delights of the March 2018 snow. Pony Dog Skye wonders if you can guess where Pony Bob has been - his "fringe" will give you a clue.....! (He's inquisitively sniffing Liz's snow spade.....). (Sundays times are flexible to meet the needs of duties which need to be prioritised at Traprain on Sundays by Liz. All times for Saturdays and Sundays may need to vary according to pony needs and weather conditions.....! on 07454 655 955 for confirmation - thanks. Leaflets featuring the work of Rangers, volunteering, walks and "all things conservation in East Lothian" are available from the stall. 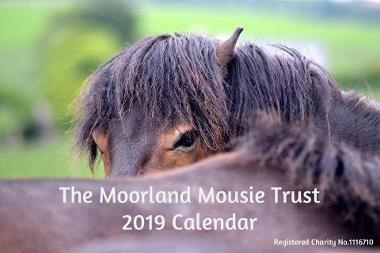 Specially designed Notelets for MMT are available from the Traprain Stall featuring ponies Freddy & Pascoe who are shown lower down on this page (see "Fostering Time"). These wonderful Notelets have been specially created for MMT by Gail Crane and all proceeds from the sale of this Card go to The Moorland Mousie Trust. A selection of 2018 MMT Christmas Cards and MMT Calendars for 2019 are also available from the Stall along with a small selection of MMT merchandise - great for Christmas presents! Lots of great merchandise are all obtainable direct from the MMT online Shop. Just click on the link below to visit the online Shop. 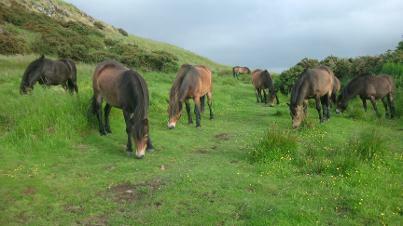 Above left: ponies sheltering in gorse from strong winds. Above right: ponies are pleased the winds have stopped! 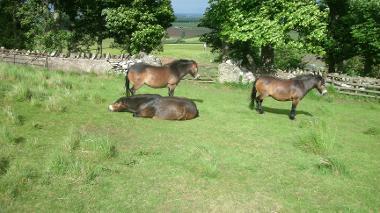 Ponies in the Summer of 2017 resting in another sheltered area. Do you think you know Traprain well? Where do you think this beautiful natural rock basin can be found on Traprain? 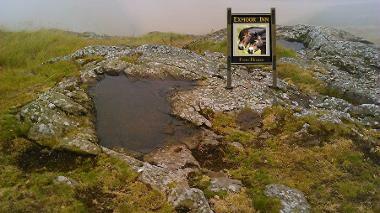 (The Pony Sign "Exmoor Inn" is the creation of Sylvia Beaumont - and is not really on Traprain!). Youngest Pony Bob just loves to give everyone his toothy smile to greet them! 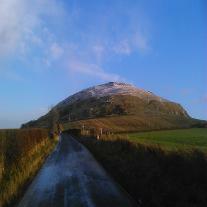 Above: Beautiful snow capped Traprain Law viewed from the north west corner. 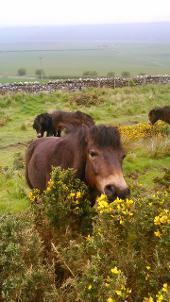 Above: Pony Pegasus-Whistler enjoying some delicious gorse! 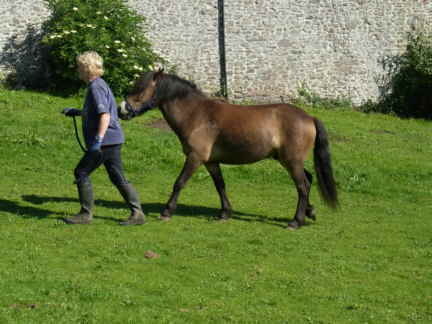 Above left: Whistler (Pegasus) at the Exmoor Pony Centre when he was 9 months old. 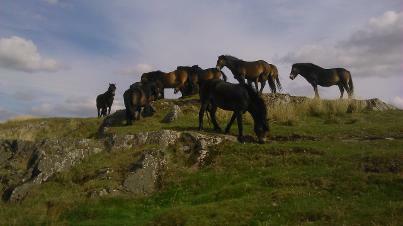 Above right: Whistler (foreground) as he is today with some of his herd, a very proud, confident pony who graces the slopes of Traprain with such ease and delight. 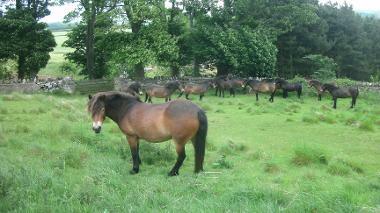 Have you ever thought about fostering a wonderful MMT Exmoor pony? 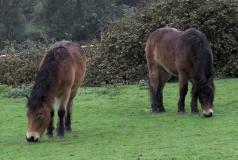 Barry and Gail are MMT volunteers at the MMT Exmoor Pony Centre with good experience in the "Art of Pony Fostering". When Liz visited Gail & Barry at their home near to the Exmoor Pony Centre she was privileged to meet Freddy and Pascoe who are a real credit to Gail & Barry's dedication to pony fostering . Freddy and Pascoe have recently moved on to "Pastures New" now with MMT and if you would like to find out more about their new adventure just click on the link below which will take you to the MMT Blog. 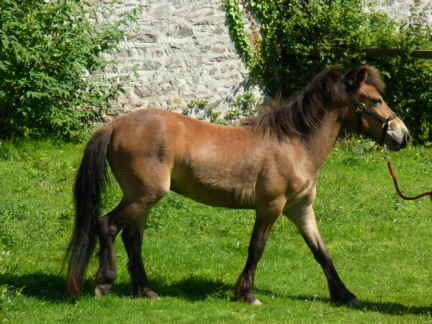 Are you wondering what this wonderful horse called Rose has to do with the 13 Pony Kings of Traprain? Rose was the dear friend of Traprain Pony Checker Volunteers Judith & Steve and Judith has written a beautiful poem dedicated to Rose. To read the poem just click on the link below which will take you to the Panetta Healing Writers' Corner website. I wanted to share some photos with you as a Celebration of the wonderful work MMT do on behalf of my fellow Exmoor pony pals. 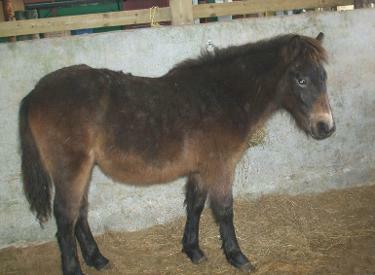 MMT rescued me when I was just 6 months old; through the love, patience and devotion of my human friends at the MMT Centre I was given a new beginning and, as you can see from the photos, today I am very proud to say I am one of the 13 Pony Kings of Traprain - as well as "step-dad" to youngest Pony Bob. No pony could have greater friends than I have within my herd - and each one of us have our own "MMT story....."
Liz Mercer, who is a volunteer for MMT and East Lothian Council's Conservation Service, has created this website as a celebration of their work and dedication in ensuring that our generation - and generations to come - are able to witness first hand the joy of a well maintained and thriving natural landscape while at the same time helping to ensure the stability of the rare-breed Exmoor pony. Liz meets many visitors at Traprain Law from both East Lothian and as far away as Australia, New Zealand and the USA. Just like Liz, the visitors she meets at Traprain Law find that just through the experience of walking to the Traprain summit and witnessing the Exmoor ponies in their natural habitat gives them a true sense of wellbeing and calmness that is so frequently lost in today's fast pace of life...... .
for featuring the MMT Traprain ponies in the Winter 2014 and Spring 2015 editions of the Magazine. "The biodiversity process begain over 20 years ago following increased international concern about the loss of wild species and habitats. Although improvements have been made, wild species and habitats are still in decline due to human activity. It is widely recognised that humans cannot live without biodiversity and that we need to reduce our impact on the natural world. (Countryside Report 2014-15). 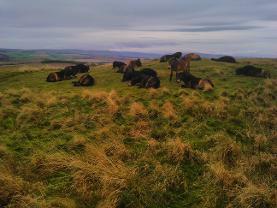 "Traprain has extensive areas of mineral rich unimproved grassland - a rare and declining habitat within East Lothian". (Countryside Report 2014-15). Thyme growing on upper west slope (2015). Opposite are Dandelion & Unicorn - the "Stars of the Season" at Traprain Law. As we sense the Pony Energy of our ancestors within you. Our silhouettes dancing to Traprain's form. If you live in East Lothian, Scotland, UK and have a child keen to learn to play a musical instrument but disadvantaged by income for "one to one" tuition The Whistler Music Foundation could be just right for you! UPDATE MARCH 2018 : The Whistler Music Foundation has one place available for a student wishing to learn classical guitar (guitar can be provided). For full details visit the www.greenstringsmusic.com website "Whistler Music Foundation" page.